Bail is an amount of money that is set during a criminal case. If the accused posts the bail amount or secures a bail bond, they can be released from custody while their case plays out. As long as you make all your required appearances and remain within the conditions of your release, the bail amount will be returned to the individual at the conclusion of their case, less any fines or fees. If you use a bail bond company, you’ll only have to pay a small percentage of the bail amount to the company (about 10 percent), but your money will not be returned upon the completion of the case. The first thing the judge will look at is the severity of the crime as a whole. Certain felony-level offenses may prevent you from being eligible for bail or they may result in a high bail amount. Additionally, judges also examine your risk to public safety. If you’ve been caught embezzling, your risk to public safety is probably much lower than if you assaulted someone or injured someone while driving drunk. Finally, the judge looks at your likelihood of showing up to your court appearances should you be granted bail. If you’re a threat to skip town, or you’ve jumped bail in the past, your bail amount will be increased or denied altogether. 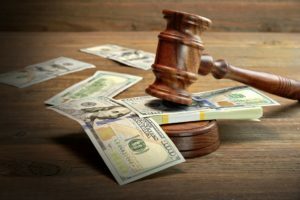 Certain misdemeanors or gross misdemeanors involving auto accidents, DWIs, driving without a license or for crimes involving stolen goods, bail amount is capped at four times the maximum fine amount. For DWIs involving at least one aggravating factor, judges are required to impose a maximum bail amount. For some assault or child endangerment charges, the bail amount can be set at six times the maximum penalty amount. For certain domestic violence crimes, the bail amount can be up to ten times the maximum fine for the crime. If you need help posting bail or defending your criminal case, please reach out to the experienced lawyers at Appelman Law Firm at (952) 224-2277.